Madison Belcher of Texico, N.M., with her Grand Champion Market Goat. 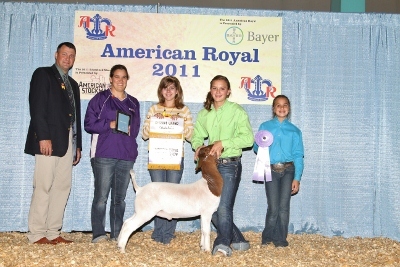 Reserve Grand Champion Market Goat was shown by Sierra Martin of Mason, Texas. Dr. Brian Faris of Westmoreland, Kan., evaluated the 76 market goat entries in the American Royal Market Goat Show. Madison Belcher of Texico, N.M., exhibited the Grand Champion Market Goat. The 116-pound animal was first named Champion Division III Goat. Reserve Grand Champion Market Goat honors went to Sierra Martin of Mason, Texas. Martin’s 97-pound goat was named Reserve Champion Division III Goat earlier in the day. 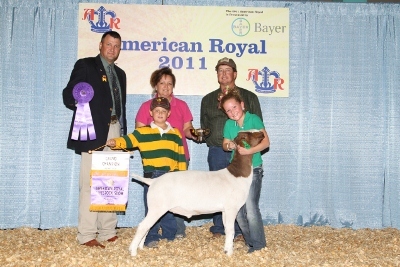 In Division I, Jordan Mackey of Muskogee, Okla., exhibited the champion goat, with her 85-pound entry. Reserve champion in the same division went to the 84-pound wether, shown by Morgan Craig of Hurlbert, Okla.
Dillan Anderson of Perkins, Okla., exhibited the Champion Division II Goat, who weighed in at 91 pounds. Additionally, Cole Cobb of Fort Gibson, Okla., showed his 91 pound goat to Reserve Division II honors.